In February, 2016 the U.S. Environmental Protection Agency (EPA) settled a lawsuit by committing to develop a program to prevent an clean-up chemical spills into our nation’s water bodies. Now EPA has unveiled the details of this hazardous spill prevention program: There will be no program! Download and share our action alert and fact sheet! The Clean Water Act, passed in 1972, authorized the U.S. Environmental Protection Agency (EPA) to create a program to prevent spills and leaks of hazardous substances into water bodies. Like the “Spill Prevention, Control and Countermeasure (SPCC)" program for oil spills, the chemical discharge program was meant to protect drinking water sources and ensure that water remains safe for fishing, recreation, and wildlife habitat. Unfortunately, EPA never set up such a program. This leaves communities near facilities where spills and leaks could occur in jeopardy. A 2014 Environmental Justice Health Alliance report Who’s In Danger: A Demographic Analysis of Chemical Disaster Vulnerability Zones found that communities of color and low-income communities are at risk from chemical releases from over 3,000 facilities across the country. In 2014, a corroded chemical storage tank leaked 10,000 gallons of a chemical used to process coal into the Elk River in West Virginia. The Elk River is the sole drinking water source for more than 300,000 people, who were left with water that could only be used for toilet flushing and firefighting for more than a week. In the wake of this disaster, the Environmental Justice Health Alliance, People Concerned About Chemical Safety, and the Natural Resources Defense Council sued EPA to develop the long-overdue Clean Water Act program to prevent and clean-up hazardous discharges into water. In 2016, EPA agreed to finalize these safeguards by 2019. Instead of proposing this vital program, the agency responded to the lawsuit by announcing it would not propose a plan at all. Nothing -- EPA is has proposed to take no new action at this time (Summer 2018). The agency has reviewed other federal programs that impact storage and release of hazardous substances. It has also reviewed records of some of the spills that occur nationwide each year. The agency claims that not enough uncontrolled releases into water occur each year to justify a new regulation. The agency also claims that existing programs are solving the problem. What is Wrong with the Proposal? 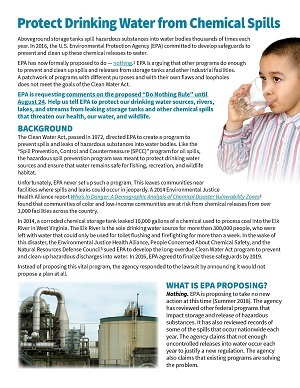 EPA’s analysis dismisses the impact that chemical spills from storage tanks and other facilities can have on people’s health, on drinking water sources, and on communities’ well-being. Other federal programs do not address this problem comprehensively. Relying on other programs that are not designed to address spills, leaks, and other discharges of hazardous substances from industrial facilities disproportionately impacts communities with high concentrations of risky facilities. We need robust plans for prevention of chemical spills, and for containing and cleaning up hazardous substance discharges. Otherwise, there will be gaps in protection for drinking water sources, for people’s health, and for water quality that is safe for swimming, other recreation, fishing, and wildlife.